Finding your pup's perfect collar size is easy. 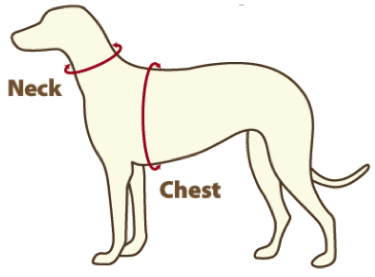 Use a measuring tape to find the circumference of the neck where the collar normally rests. Make sure not to pull too tight or too loose. No measuring tape? Use a string then measure it against a flat ruler. Now that you have the correct neck circumference, simply choose the appropriate size from the drop down menu in the sale listing. All our collars are adjustable so you'll have extra space to get the perfect fit. We haven't forgotten our kitty friends either! For them we offer a breakaway collar for added safety. Just select Cat in the drop down. Only available in the 1/2" width. We recommend spot cleaning only for the bow tie itself. a net bag and let it air dry.